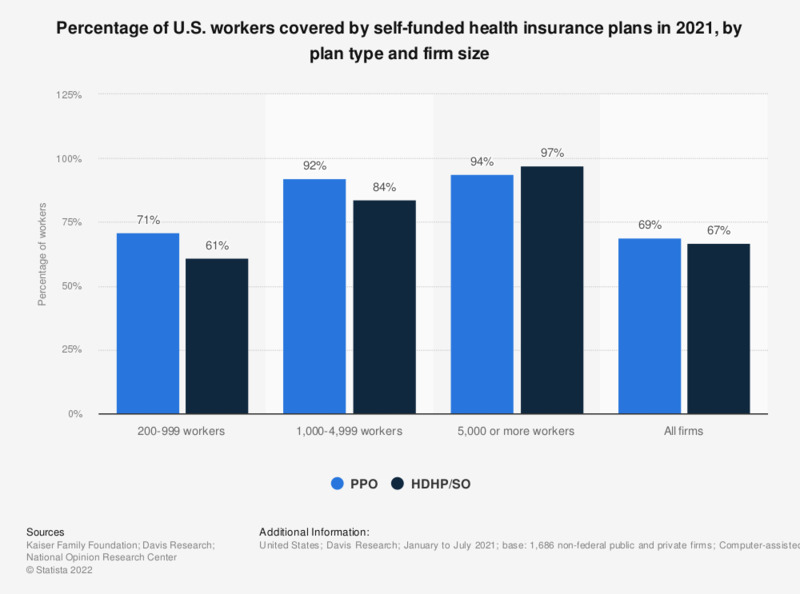 This statistic depicts the percentage of workers covered by self-funded insurance plans in the U.S. as of 2018, by industry. According to the data, among all firms, 67 percent of employees were covered by preferred provider organization (PPO) self-funded insurances. Self-funded plans are those in which companies choose to pay for some or all of the health services of their workers directly rather than purchasing health insurance for them. Figure includes covered workers enrolled in partially or completely self-funded plans. Self-funded plans are those in which companies choose to pay for some or all of the health services of their workers directly rather than purchasing health insurance for them. HMO = health maintenance organization. PPO = preferred provider organization. HDHP/SO = high-deductible health plan with savings option.